I know that buying birthday cakes is lot less work, and that you can get some lovely ones in the supermarkets now, but the fact is I like making them. I relish the challenge and it's a creative outlet. 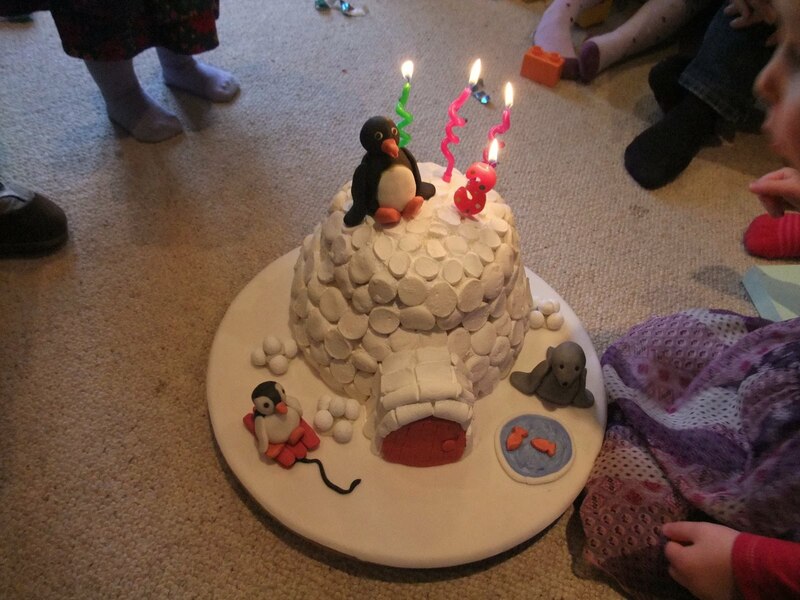 Moon's birthday is next week so I'll be blogging again soon about her cake, but the Bean has just had her birthday so I thought I'd do a little post about hers. 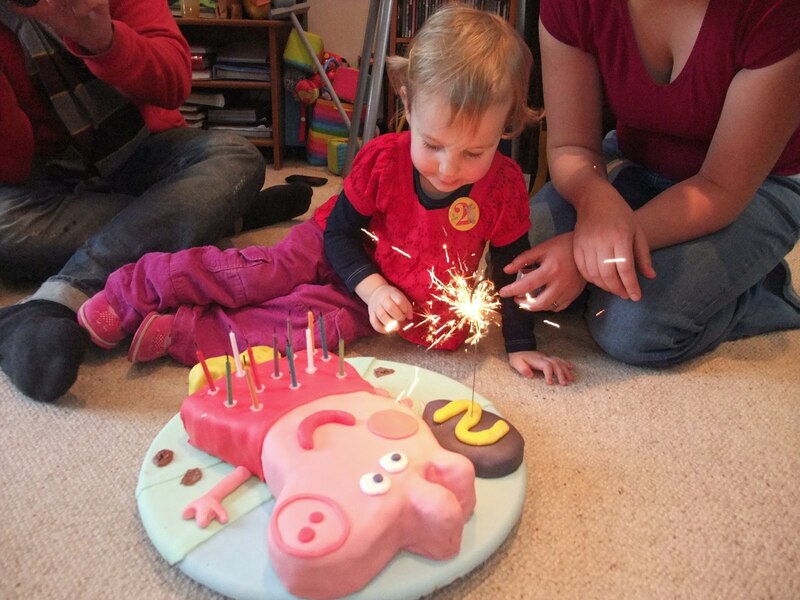 I've written before about my adventures in cake making: Peppa Pig, Pingu, cupcakes, and a Dinosaur. Since she loved her 2nd birthday dinosaur so much, the Bug asked for another one for her third birthday. Well that's easy! Pushed the boat out a little more on that one, and went for diplodocus rather than triceratops, and made it her favourite colour. These cakes are easy, people. There's a tutorial for the dinosaurs in the link above. The Bean last year requested a butterfly and flower cake and asked that it be pink and purple. Well the butterfly was pretty easy, just a sandwich cake cut in half with cupcakes down the middle. And yes, it's pink and purple the whole way through. How to do that? Split the cake mix in two and colour it, then put dollops of each in the tin. The flowers were so popular I only got time to take this rubbish photo before they were gobbled. Yes they are cake pops with regal ice petals. I made them buy 'threading' the petals onto the dried cakepop while it was upside-down and letting them set before turning them the right way up again. I wasn't too pleased with them to be honest, they were a bit too big and next time I'd do them smaller and take a bit more time. As an aside I do like cakepops, but I don't like the new cakepop makers. They do defeat the point a bit. In a proper cakepop you have a mixture of cake and butter icing inside and that is what makes them so marvellous. Now, those of you that know me, know that I'm not a big fan of pink. Or fairies. So when the Bean said she wanted a fairy cake for her birthday this year my heart sank. Still, I believe very strongly that the kids should have their own opinions and likes and dislikes, so a fairy cake it was to be. However there is room for a bit of sneaky influence when you are a Mum. Yes, it is a fairy cake, but it's hardly pink at all! And she loved it. I'm quite pleased with this dumpy little fairy actually. She's made totally out of shop-bought regal ice, and is holding a little butter icing flower. I made the dress using this fab little leaf cutter set from Lakeland. I did find the head a bit difficult though. I need more practice with that, but D did point out the first head was way to big and she looks infinitely better with this one. You know what? This was one of the quickest novelty cakes I have done. It's just two hemisphere cakes on top of each other. I secured them together with a couple of BBQ wooden skewers just to be on the safe side and then iced her up. I like the little butter icing snails too. The little mushrooms are made from shop-bought snowflake cake toppers with a ball of icing underneath. Sainsbury's is still selling these of in packs of 16 or so for 20p after Christmas. They basically last forever, so worth getting a few, I'm sure they've got lots of uses. Amazing cakes!! I'll have to have a go next week.